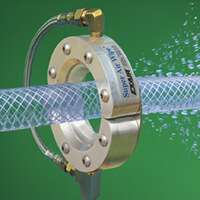 Air Wipes provide a uniform 360 degree airstream and is ideal for blowoff, drying, cleaning, and cooling of pipe, cable, extruded shapes, hose, wire and more. The split design offers easy clamping around the surface of the material mowing through it, eliminating the need for threading. 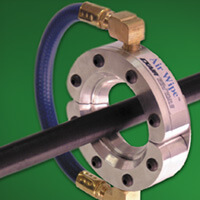 The Super Air Wipe resists corrosion and is ideal for high temperatures. The Standard Air Wipe is the economical way of air wipe to blowoff, dry, clean and cool.